Stressing about weight is something that so many people do. And when you find that you have not lost that extra kilo you get even more stressed out. Don't smash and bash your expensive ornaments, rather grab hold of our cute stress scale and bash that. It can take the strain and will always be ready for more. This fun toy is part of our premium range of stress promotional items that are brandable with your company logo and graphics. These toys are ideal for weight loss companies, hospitals, gyms, pharmacies and medical businesses. They make fun give-aways at trade shows, seminars, expos and conferences. 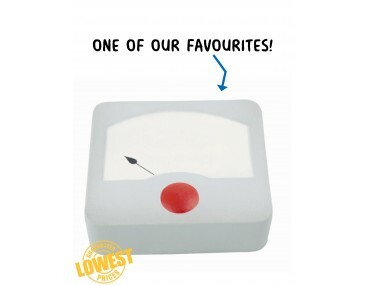 Our cute scale is made in a three-dimensional shape and features a big bold button at the base and a measurement screen. A dark handle with a pointer on top is waiting to indicate your weight. Keep this toy on your desk and bash it around to get rid of pent up frustration, it is fun and you may even lose some weight as you work the muscles in your hands. Let us help you create a great marketing campaign when you brand these scales. Our listed price includes branding of your logo or graphic in a single colour print. Please note that our prices exclude GST and a print set up of $75 applies. This product is supplied in bulk quantities. This product is stocked and branded in Australia and is available for delivery within Australia only. For larger orders ask about our custom made indent production service.